Fiber Flux: Free Crochet Pattern...Merry Berry Dishcloth! 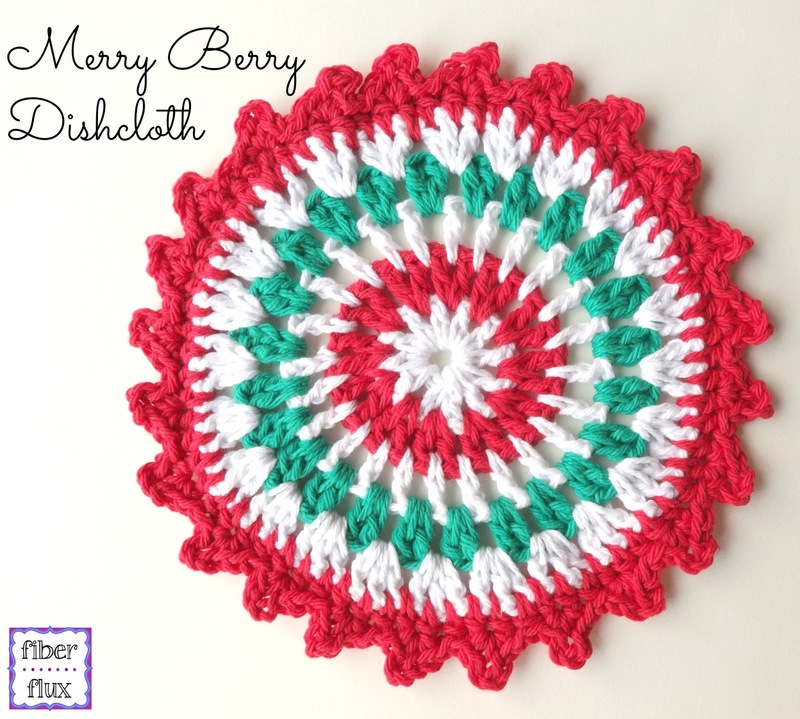 Free Crochet Pattern...Merry Berry Dishcloth! 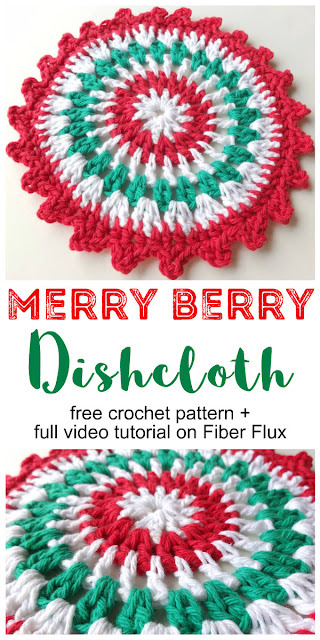 The Merry Berry Dishcloth is a fun, easy, and pretty way to add a little holiday cheer to the kitchen this season. 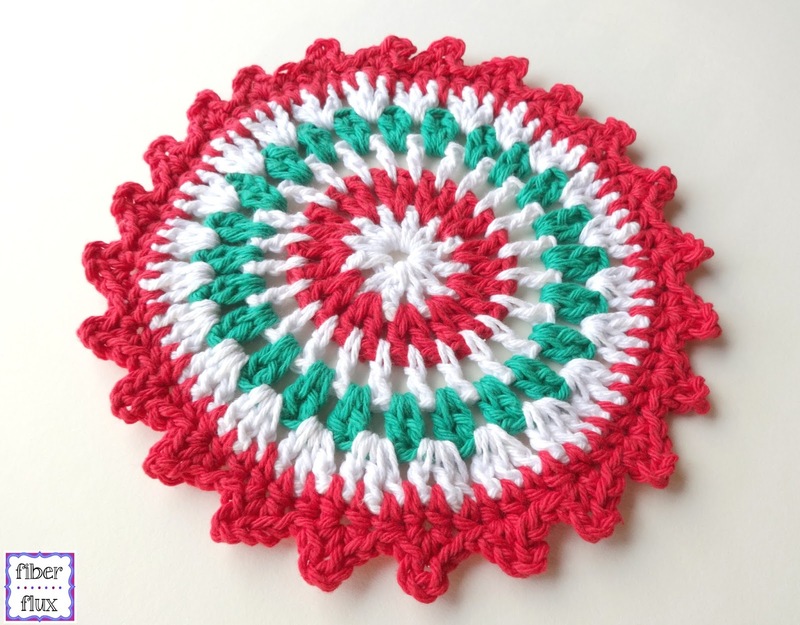 Crocheted in festive stripes and finished with a pretty edging, the Merry Berry Dishcloth makes a great gift too...try working a few up to make a set of them! 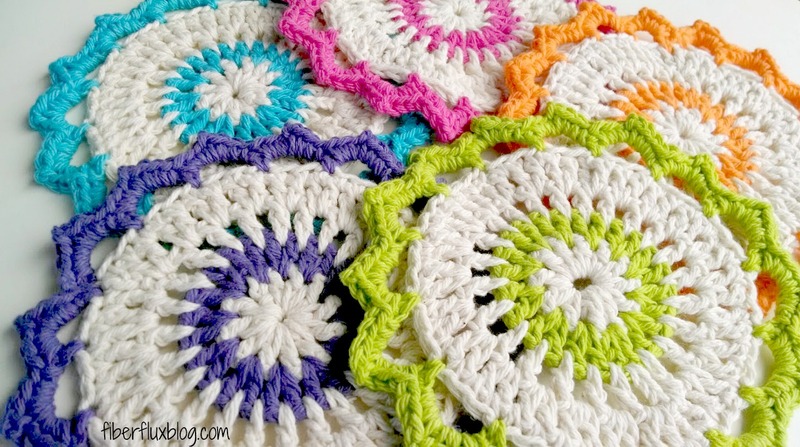 This Dishcloth was inspired by my Lotus Bloom Dishcloth pattern, get the pattern here! Foundation (worked in white): Chain 4 and slip stitch into the chain farthest from your hook to form a ring. Round 1 (worked in white): Chain 3, then work 11 dc into center of ring, join with a sl st to join round. Round 2 (worked in red): Ch 3, then work a dc in the same space, *2 dc into the next space, repeat from * to end of round. Round 3 (worked in white): Ch 3, then work a (dc, ch 1) into the first space, then *1 dc into next space, ch 1, then repeat from * to end of round. Round 4 (worked in green): Ch 3, work a dc in the same space, then work *2 dc into the next space, then repeat from * to end of round. Round 5 (worked in white): Ch 3, work a 2 dc in the same space, then work *3 dc into the next space, then repeat from * to end of round. Round 6 (worked in red): Ch 2, then work a hdc in each space all the way around (in between each dc from previous round). Round 7 (worked in red): Note: this round is worked in the stitches (not spaces). Work a *sl st in the first st, sl st in the next st, then in the next st, work (sc, ch 3, sc). Repeat from * to end of round. Fasten off. Weave in all ends and you're done! Very pretty! We've just moved to a fixer-upper and won't be doing a lot of decorating this year because of the work being done so I've been making small, festive items to help get in the mood. This is a PERFECT candidate for that! 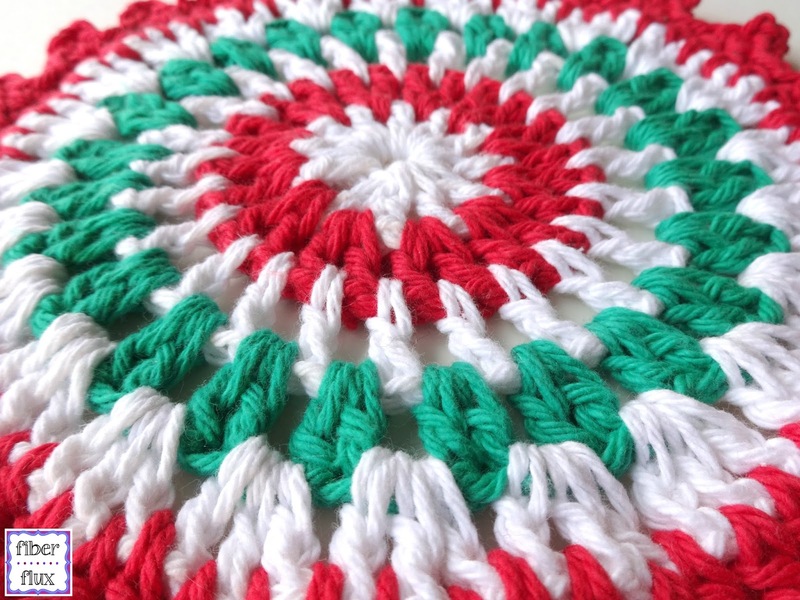 Do you have a printer friendly link for this pattern?